Chaikin Money Flow is one of the popular indicators used by majority of active traders especially technical analysts. It is the foundational building block of some very profitable algorithmic trading systems. In this post, we would go through a fully automated Excel sheet which calculates Chaikin Money Flow for any stock symbol. The sheet is also equipped with real-time buy sell signals and backtesting result for intraday timeframe. Read on to know more about this indicator and you can download the excel sheet from the end of this post. What is Chaikin Money Flow? Chaikin money flow (CMF), is an oscillator whose values range between -1 to +1. It signifies the buying or selling pressure of a security for a particular lookback period. Any lookback period can be considered, but 20 or 21 periods are the most common values. CMF was formulated by a renowned technical analyst named Marc Chaikin. This indicator is very accurate as it measures the money flow volume for a specific period. The combination of money flow and volume in a single indicator makes it a popular choice among technical analysts. Chaikin Money Flow values oscillate between -1 and +1. Any positive value or a move from negative to positive territory is considered as Bullish. While any negative value or a move from positive to negative territory is considered as Bearish. All the above calculation and interpretation steps have been completely automated in the Excel sheet. 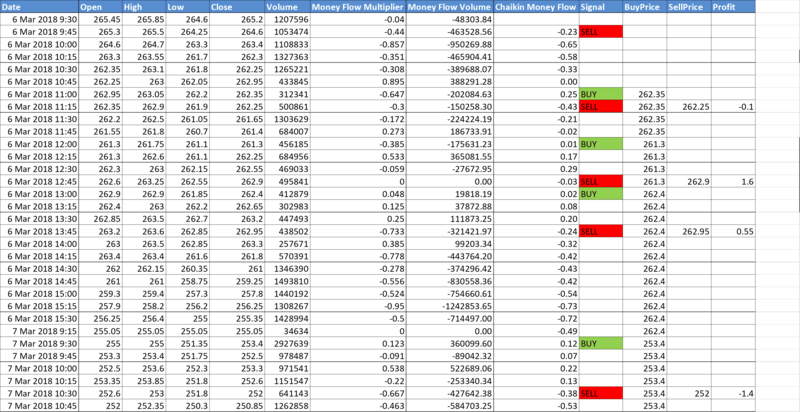 This is an automated macro enabled spreadsheet which calculates CMF value and Buy/Sell signals for the symbol entered. Also, it would auto calculate the profit/loss points based on the signals. You need not to do anything manually. Step 4: Click on Get Data button. The data would be automatically downloaded and CMF values would be calculated. This data can be downloaded for max 15 days and the minimum interval is 1 minute. Step 6: Check the Total Profit section for the overall profit/loss for the given period. Please see the below link to download CMF indicator excel sheet. Let us know if you have any feedback or comments. Thanks for this sheet. 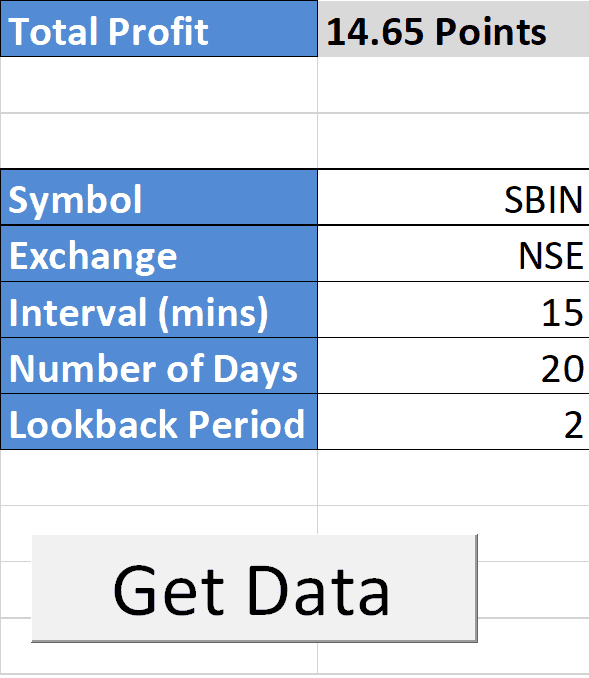 Can we have intraday data for multiple stock in single sheet? if Yes, I request you to pleas share it. Can we have data from multiple stock on same sheet. No, its not possible in the current sheet. can we get the figures for Equity Future for NSE? Unfortunately its not possible currently. Can we use it for the MCX Commodity? Ofcourse you can. All the strategies and systems posted in this website are universal and do not cater to any particular financial instrument.